Weba has been a respectable name within the Belgian furniture market for the last 30 years. They are headstrong and rebellious within their advertising, which definitely resonates with us at Baldwin. Our collaboration started în 2016, when we created the webshop using Magento1. 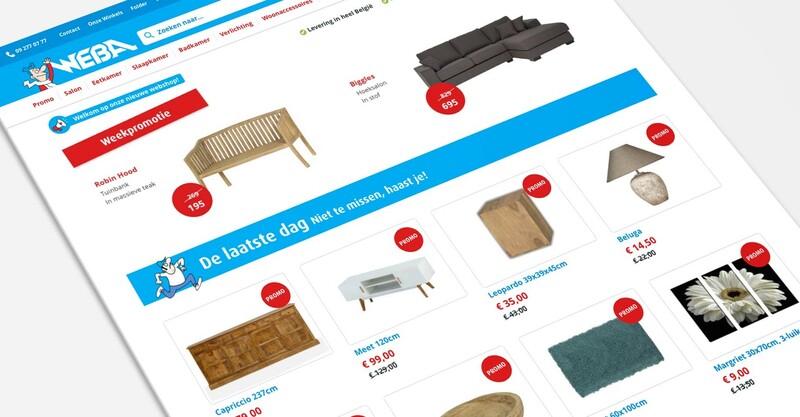 Almost 9 months later, a new Weba webshop was born, which made it the first big Magento 2 webshop in Belgium. Prior to the development of the actual webshop, we performed a lot of research. During our first meeting, the marketing team made itself acquainted with Weba’s strengths and the longterm business goals of both Weba and their webshop. 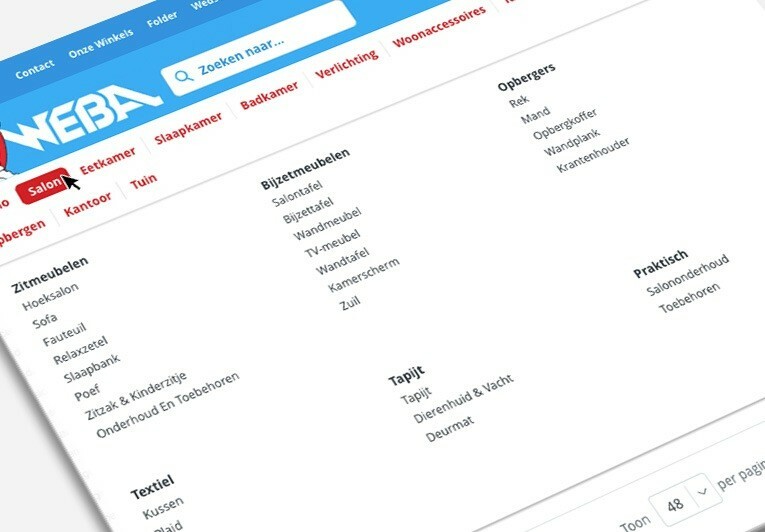 Eventually, the online concept started to take shape: Weba stands for a straight forward approach, which relies on their quality products at sharp prices, a logistically strong organisation, and the recognisability of their mascot Arsène Weba. The Weba assortment is targeted towards a broad audience: they offer a wide range of furniture styles all at once, in which they don’t focus on one specific lifestyle. The product is put at the centre of attention, both in the physical stores as on the webshop. Using ‘Personas’ – fictitious model Weba costumers – turend out to be a great way of figuring out the large number of different target audiences and their respective needs. Which channels do potential customers use to search for these products? Which barriers do they experience while shopping for furniture online? How does your online presence have an influence on the sales of physical multichannel furniture stores? the result of this research: a SWOT-analysis. 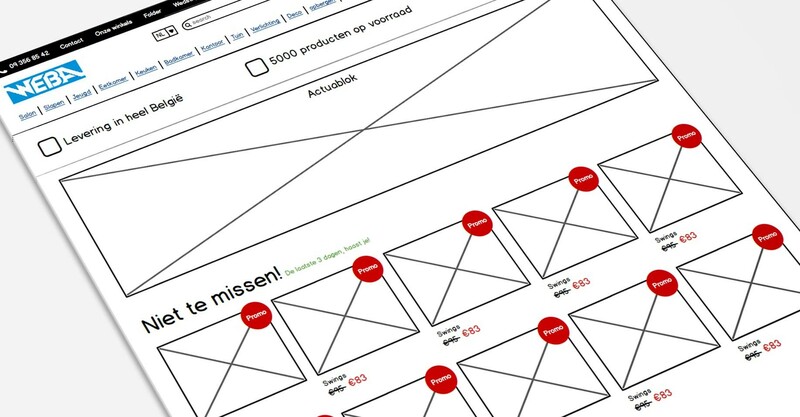 This gave an overview of Weba’s online risks and opportunities, and would eventually form the foundation for a first wireframe, a blueprint of the primary webshop pages. After a couple of wireframe rounds, the structure started to take shape, with a definitive design based off the existing corporate identity of Weba, accompanied by the iconic drawings of cartoon artist Marec. Marec even made a number of unique drawings, just for the new webshop. The presence of Arséne and friends amplify the recognisability of the webshop and makes it stand out from its competitors. The assortment of Weba has over 8000 products. That being said; designing a user-friendly navigation was a challenge. The number of subcategories and filter possibilities were vastly extended. The user’s needs and wishes were taken into account throughout every step of the purchasing-process. Visitors who know what they are looking for can navigate through the website effortlessly by using the large dropdown menu. By using large window tiles on the product summary pages, visitors who are still hesitant or just curious can easily refine their search and find the product that is right for them. When checking out a product they are interested in, potential customers will be offered suggested products on the detail page of every product, as well as a summary of every product within that specific furniture set. This way, customers can easily browse through the wide range of products that match their own personal preference and taste. Naturally, the webshop is mobile friendly. This is important, considering the number of mobile visitors has increased drastically the last couple of years. The mobile webshop shows a compact version of the content, and smaller product photos. This way, the webshop is still accessible on a smaller screen, without taking anything away from the user experience when using a smartphone or tablet. Weba decided to collaborate with Combell as their hosting partner. On top of having a lot of experience with Magento, they are experts in installing load balanced systems. A load balanced system distributes all digital processes across multiple servers. This way, the webshop is able to handle up to 15 000 visitors per minute. This is absolutely paramount, considering national tv-campaigns often attract a high number of visitors. Sizing Servers put the true power of the webshop to the test through stress testing: towards the launch of the new webshop, the maximum capacity was tested multiple times and adjusted accordingly by finetuning our scripts and server environments. 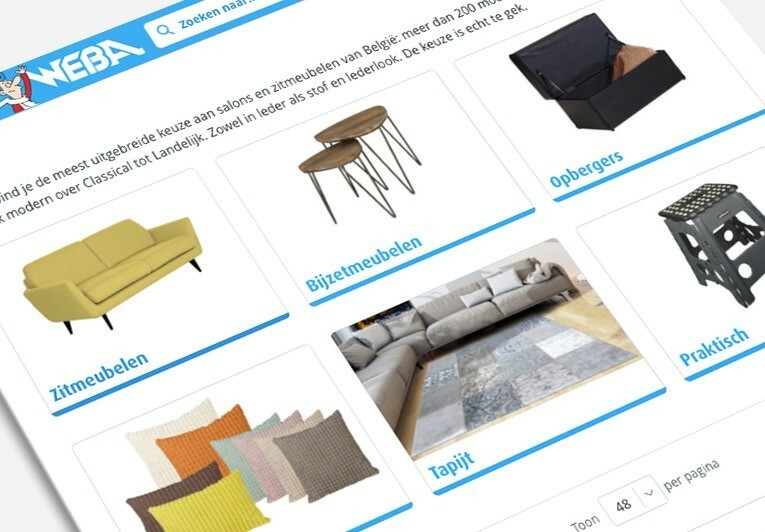 For a nationally renowned furniture business like Weba, it’s essential for all of the logistic elements between the webshop and physical stores to be synched with one another. For the checkout and warehouse processes, Weba has been using the Asci software for years. With Asci, Baldwin was able to deliver a seamless integration of both systems, which took quit a bit of custom development. When a customer places an order on the webshop, that order is immediately processed with Asci’s software. This stock and order data is synchronised in Asci with Magento multiple times a day. On top of that, the availability of every product is checked, in real-time, in a number of crucial places: the shopping cart, product pages and check-out process. Doing this allows us to avoid situations where products are bought on the webshop, when these were recently sold out in one of the physical stores. This real-time check of stock was not available in Magento yet, and was therefore custom developed by the Baldwin developers, in cooperation with the Asci team. The delivery method is determined by the content of the shopping cart. The costs for delivery are calculated in real-time when a customer enters his/her post code. This function was custom developed by Baldwin as well. The launch of the new webshop was paired with an ambitious communication plan for both national television and radio, as well as incorporating online channels for the very first time. For Weba, Baldwin presented an online communication plan based on the 3 step stategy: See – Think – Do. General campaigns through Youtube, Google Display and Facebook aim to raise awareness of the Weba brand with a large target audience. Recent visitors are reminded of their visit with a personal ad in their Facebook newsfeed or other websites. With our “Do” campaigns, we reach potential customers who are in the last phase of their purchasing process, when they actively search for Weba in the Google search engine. Search and shopping campaigns strengthen Weba’s online presence and amplify their SEO ranking. Plan on shopping at Weba in Ghent or Deinze? At Baldwin, we’re just going to go ahead and shop from our couch. And we already know our favorite one: the Baldwin couch!